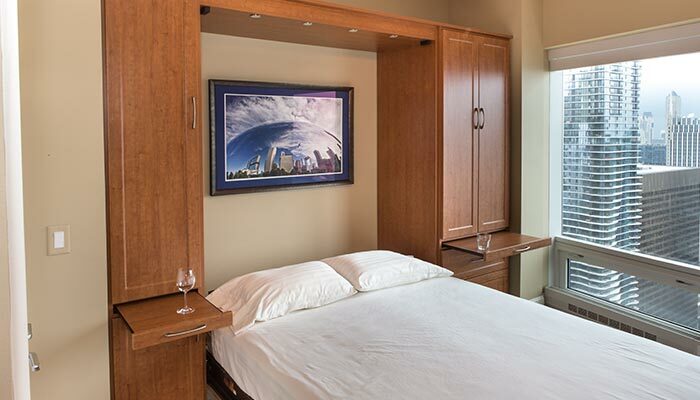 What do you do when you live in a lofty high rise condominium like this one and you need to add another bedroom to your home? 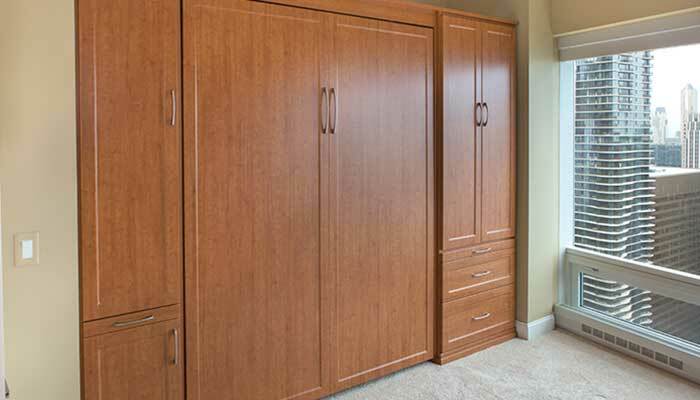 Unless you feel comfortable approaching the condo board with a plan to cantilever a twelve foot addition outside your window, your best bet is to consult Closet Works for a plan to make your existing space do double duty. 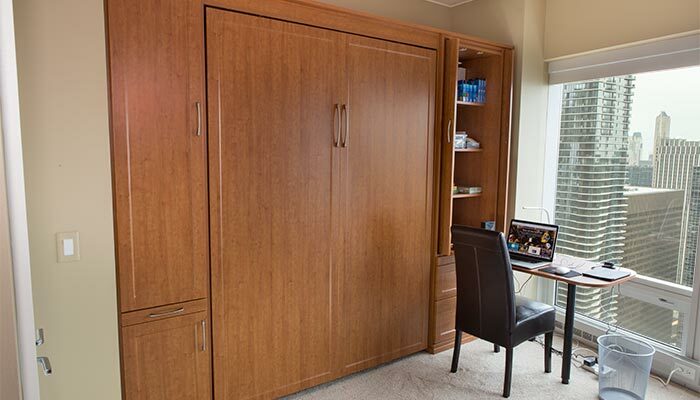 This homeowner opted for a beautiful wall system in Sienna Apple from Closet Works Chicago that includes a custom full size wall bed / Murphy bed big enough to sleep two, plus enough cabinets and drawers for any storage needs. The side cabinet includes a custom, pull down table designed with the functionality of a Murphy desk that folds out from wall unit. This Murphy table is complemented by a contemporary desk system on the opposite wall that increases the efficiency of the space even more for home office use without adding a lot of clutter or additional furniture to the room. 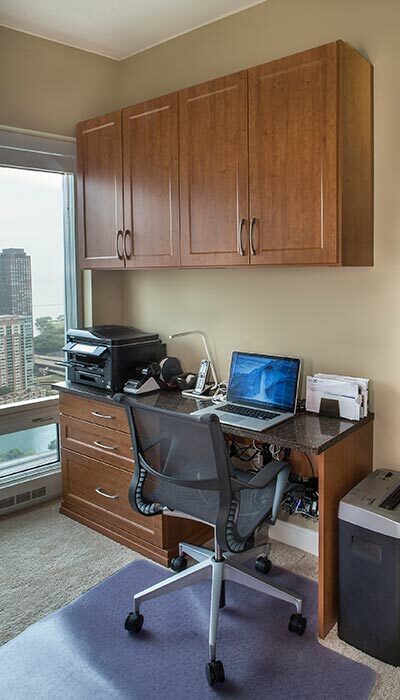 Contemporary style custom desk with upper cabinets and file drawer against opposite wall. Custom Murphy table, designed like a Murphy desk, folds out from the cabinet. 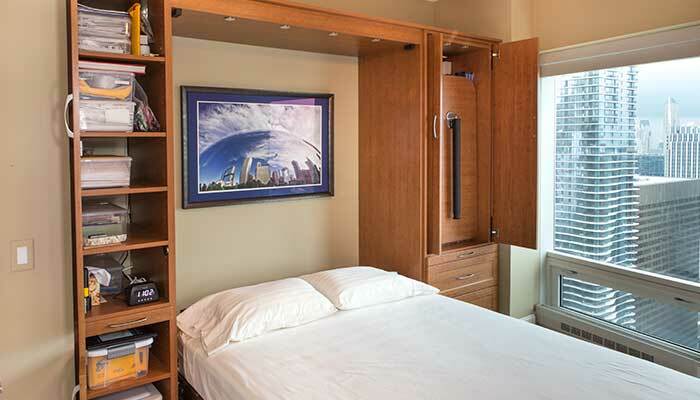 Full size wall bed / Murphy bed opens, while the custom Murphy table stays folded behind the cabinet door.